This published report contains information about field crop statistics, precipitation totals, yields from wheat, corn, oats, hay, alfalfa, and sorghum crops, and information about livestock. These statistics range from 1866 until 1938. 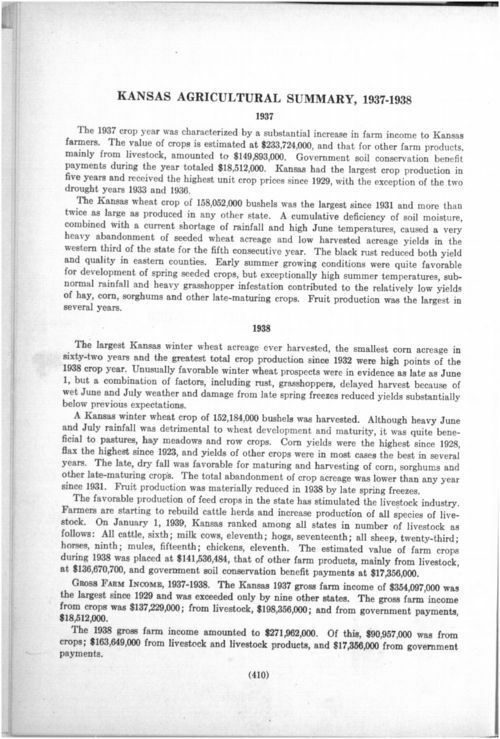 The report is included in the Thirty-First Biennial Report of the Kansas State Board of Agriculture (1937-1938). Students could use these useful statistics on the crop yields to compare agricultural production during the Dust Bowl to previous years. These statistics could work with a variety of sources selected for this standard.